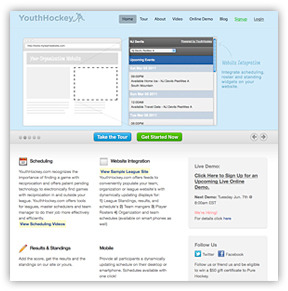 Youthhockey.com offers the necessary tools for teams, organizations, and leagues to efficiently manage information such as schedules, team contacts and team rosters. This technology allows for users to create calendars complete with practice and game schedules that can be easily viewed on a smart phone, or integrated into an organization’s website. Unlike other programs Youthhockey.com provides unique technology to manage this information as opposed to just displaying it. Patent pending technology assist scheduler's with electronically finding games with reciprocation. Useful summaries, reports, and displays are generated from these schedules. With these tools available teams, organizations and leagues can run more smoothly, and parents and players can always have the most recent schedule at their fingertips. Founded in 2008 and launched in 2010, Youthhockey.com targets youth hockey leagues and organizations that are challenged with the task of maintaining accurate schedules, making best use of available ice, creating parity among divisions, and tracking results and standings. Youthhockey.com is free to all participants. The company's stated goal is to have everyone use the system and they claim the database is built to handle hundreds of thousands of events. In 2010, the site was used by over 1,000 teams who posted over 9,000 events. The site’s founder, Marc Friedfertig, a player, coach and father to three hockey players, understands the challenges faced by Youth Hockey organizers. Friedfertig got the idea after seeing his wife, the team manager, send endless emails and fret over who to play and when. Friedfertig presented the system to several Master Schedulers and a few leagues. The feedback he got was invaluable, generated new ideas, and more importantly validated the need for such a system. Many of these ideas have since been incorporated into the 2011 release. Youthhockey.com can be easily learned through online tours, live online demos, as well as step-by-step instructional videos to aid users in creating schedules. The website’s blog also provides information about the site in addition to relevant hockey news. Overall, each component of the website presents useful technology that members can utilize to be better organized, create better schedules and save lots of time. Furthermore, players and parents love it, as the mobile feature allows users to view the most recent schedule right from their smart phones. Friedfertig, says the site is great for Youth Hockey and it appears he just may be right.